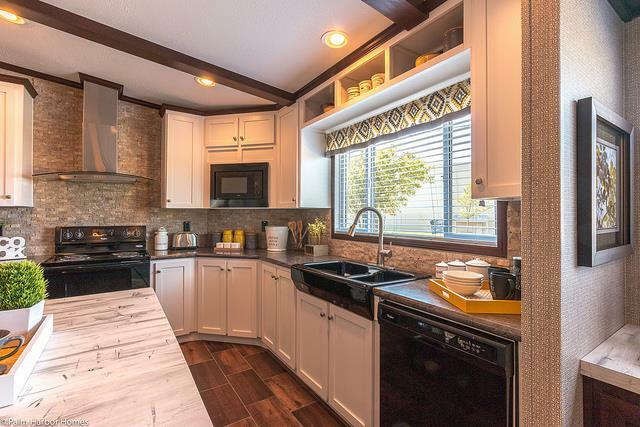 Most new manufactured home models on display at dealerships have been professionally decorated so they are a great resource for decorating and remodeling ideas. Today, we are taking a look at The Arlington by Palm Harbor. 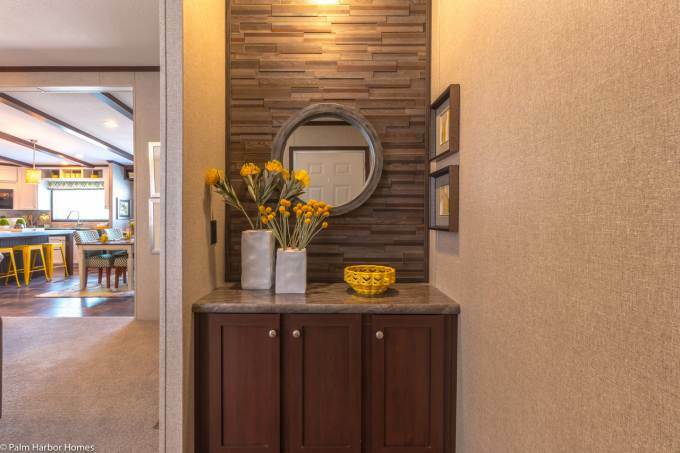 The Arlington is a picture-perfect example of modern manufactured home design. It has a great floor plan, beautiful finishes, and comparable construction features of a site-built home. 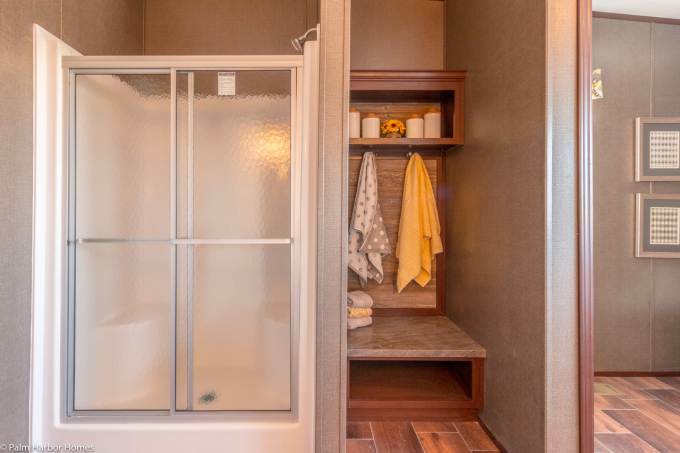 With 8 foot vaulted ceilings and ample built-in storage, this home is indicative of a traditional home in every way except one, price-per-square-foot. The stylist that decorated this home for Palm Harbor really knew how to put the home’s best features on display. 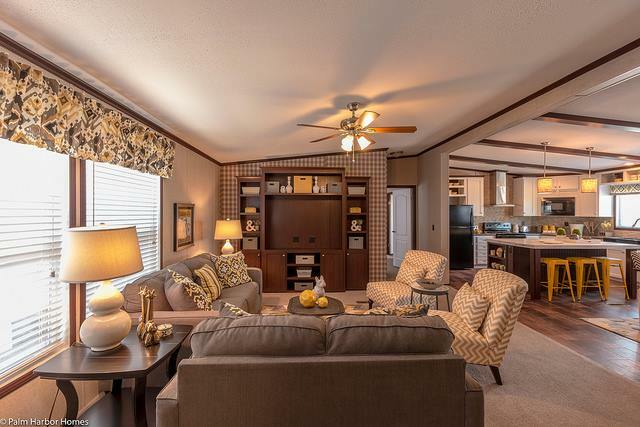 It’s a gorgeous home and a wonderful example of the beauty and function that manufactured homes offer. Unfortunately, the Arlington is only available in Louisiana, Mississippi, New Mexico, Oklahoma and Texas. 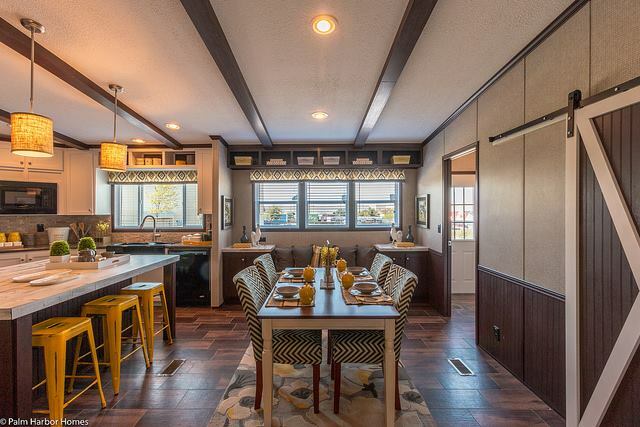 That doesn’t mean you can’t purchase a new home similar to this one – manufactured homes are easily customized and can be special-ordered with practically any floor plan, specs, materials, and size you can imagine. 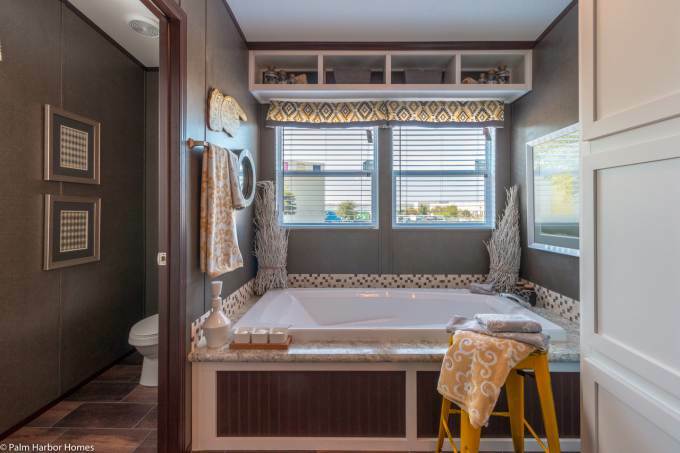 This home provides ideas that can help you with your own manufactured home decorating and remodeling. Storage is a big feature of this home. Both the dining room and living room have ample built-in cabinetry and open-shelving. You can even choose to have a window seat placed in the dining room with even more storage. Recessed lighting and stylish pendant lighting brightens up the kitchen and dining room. White cabinets, a textured stone back splash, and various wood elements are combined to create a stylish, modern kitchen. Features such as a stainless steel stove hood, rectangular faux wood tile, a large island, and a farmhouse apron sink are popular choices found in modern kitchens. 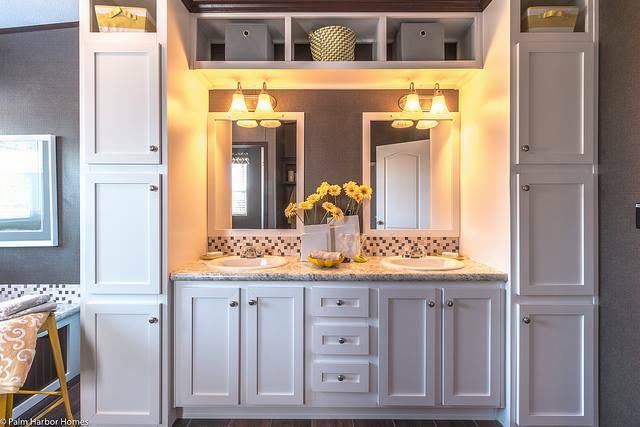 There’s plenty of counter space and storage! A sliding barn door is used to separate the dining room and a walk-in pantry. 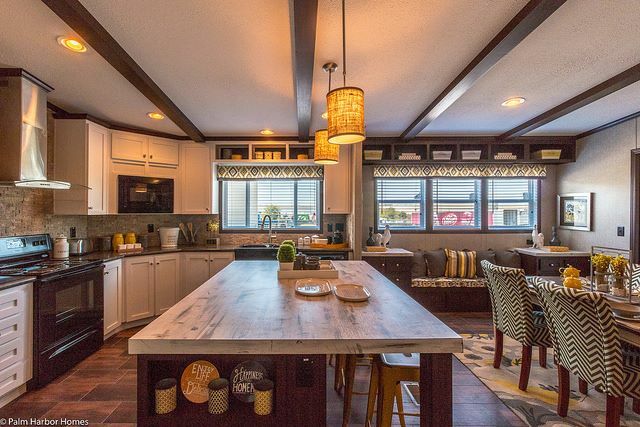 This modern manufactured home model has lots of modern style elements. From the entry way, you walk into the living room. The open floor plan of The Arlington is a popular modern home design. Below is the floor plan for The Arlington. 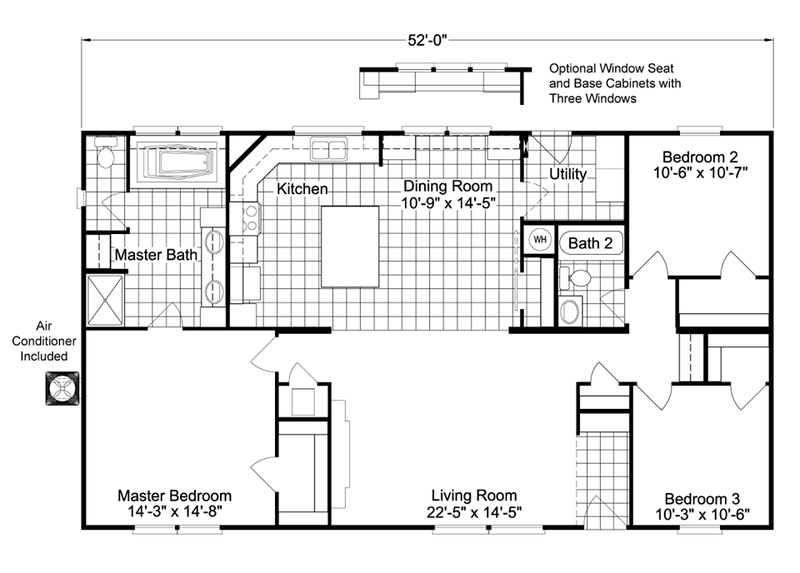 It is a simple but smart floor plan and indicative for most modern manufactured home models. All rooms with plumbing are placed together to reduce future leaking possibilities and minimize repair complications. Ample closet space along with a defined entry way keeps clutter in its place. The master suite is situated away from the other bedrooms to allow plenty of privacy. 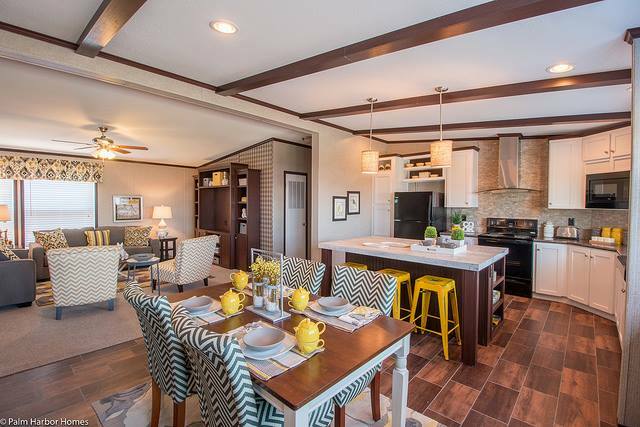 Love looking at new mobile home designs: Check out another design we featured The Sunset Bay By Palm Harbor. 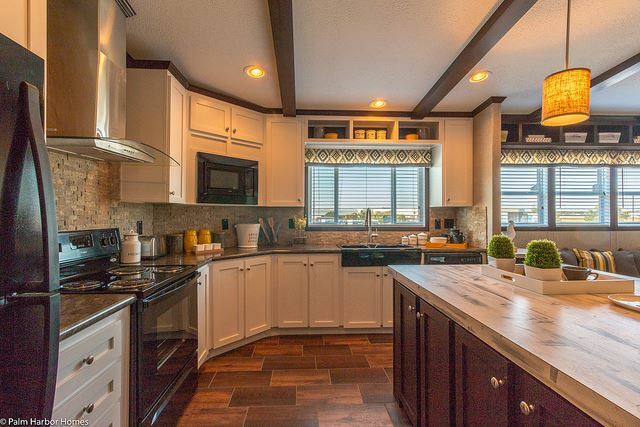 I’ve always been hesitant to feature new manufactured homes because I don’t want to seem like I favor one builder over another. However, I’ve came to the conclusion that not sharing these gorgeous new homes is a disservice to my readers. Please keep in mind that Mobile and Manufactured Home Living is not affiliated with any manufactured home company, we do not recommend or favor any one company, and we have not been paid to advertise these homes. Have you recently purchased a new manufactured home? Tell us all about it in the comments below! Thank you for reading Mobile Home Living! Really like the remodel. I like the autumn colours and very modern and clean. Thanks for sharing. I especially like the pendants. i have been wanting to expand my manufacture home my husband does new home for a living not sure who can do the floor plans? You should be able to find a pre-drawn floor plan online for a good price. 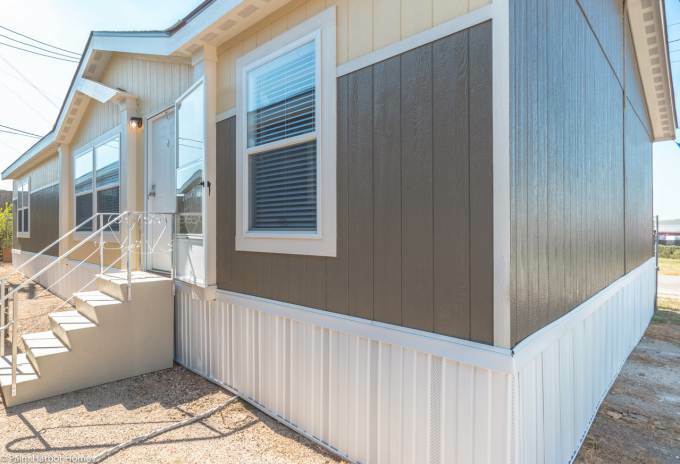 Since the addition is a separate structure that is only ‘butted’ up to the manufactured home you can have just about any floor plan you want. The floor plan is almost perfect. I would love sheetrock walls, though. Also, I like the dark siding, so I think it would look great with just that color. I really like this, and could live in it quite comfortably. Oh, one other thing; the garden tub is a pain. We have one in our house now, and we just have to dust it every week. My wife has bad knees and this is not practical for her. I am in process of ordering a palm harbor its the new line 2017 model called the santa fe http://www.palmharbor.com/model-center/caddomills/floorplan/fp-05-tx-santafe-FF16763G/#photos-videos this only has the seems on the walls in the bedrooms rest is sheet rock and instead of a tub in the master it has a beautiful walk in shower .. you have to check it out. I have bad knees too and so much of this house is like mine. I think you would love it. Congratulations Mary! That is a gorgeous home! Let us know how you like it once you get settled in. The ceiling to wall trim is another item I am not fond of as well. 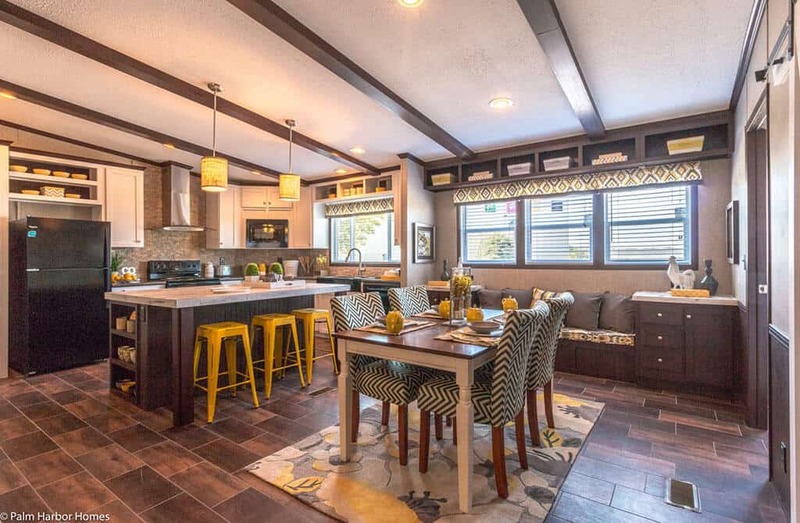 Looks nice, but the wood “beams” are real throwback to the 70s “Homette” my parents owned in a resident mobile/land owned subdivision in Newport Or. Also am not a fan of the exposed wall panel fitting seams and trimming.. The texture and tape offered by many manufacturers makes the walls look more integrated. My humble opinion. 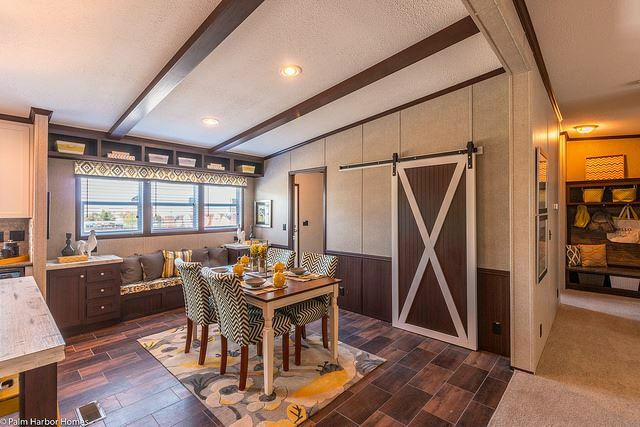 I’m all for the “trailer” cues in older homes, they’re fun to me. They just seem out of place from such a builder as Pal Harbor. We just purchased some land and a double-wide. I love the place we purchased our home from, because you get to help design it. For instance; I chose a floor plan, then I changed what ever I didn’t like. I added an extra window in the dining room, took away the two windows in the den and replace them with faux french doors. I added windows to both bathrooms, and smooth-top stove/oven, a European style vent over the stove, and a fireplace under the TV mount in the den. I’ll stop there, but there were quite a few more changes. It was so nice being able to personalize my new home! They will be finished building it in about 2 1/2 weeks; I can’t wait to use some of your ideas to further make it a warm place to live! Thanks for sharing. Great to hear from you Sherri! Thanks for sharing your experience! Still no drawers above the cabinet doors in the kitchen. Grrr. At least the master bedroom door isn’t located directly in the living room. I would have the exterior customized with regular siding, etc and a better roofline so that it looked less “trailery”/”doublewide-ish”.